George Barret was born in the Liberties in Dublin in either 1728 or 1732. After a spell as an apprentice to a stay-maker, he attended the Dublin Society Schools under Robert West, winning a prize in the 1747 examination. From the same year survives his earliest signed work. By 1755 when he signed and dated his Italianate Landscape (National Gallery of Ireland, on loan to Farmleigh House) he was clearly a highly accomplished and original artist, working in a light rococo style similar to Zuccarelli, who had recently been working in England. About five years later, probably under the influence of Edmund Burke’s thoughts and writings on the picturesque and the sublime, Barret’s style changed, becoming grander and more dramatic. Barret left for London in 1763 bringing with him some of his Wicklow views. On route he passed through the mountains of North Wales sketching the famously picturesque scenery. One of his views of the Welsh mountains was praised in a letter from James Barry to Burke in 1765 and it seems he continued to visit Snowdonia throughout his career. 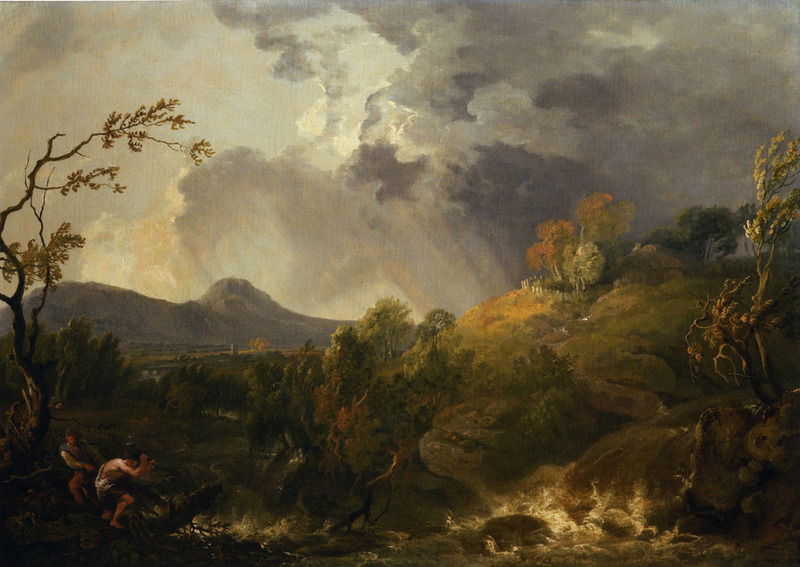 The year after his arrival in London he exhibited a View of Powerscourt Waterfall at the Society of Artists. He was patronised by the Duke of Portland, for whom he painted ten views of Welbeck, Lord Dalkeith and the Duke of Buccleugh. In 1768, Barret was appointed a founder member of the Royal Academy, although he soon fell out with many of his colleagues. Despite his success, it seems he was incompetent in managing his money and Burke writes disapprovingly in a letter to Barry: ‘Barret is fallen into the painting of views. It is the most called for and lucrative part of his business’. By the end of the 1770s, he was close to bankruptcy but was supported in these straits by William Locke who paid his debts and commissioned a decorative scheme for Norbury Park to be executed in collaboration with Sawrey Gilpin, Cipriani and Benedetto Pastorini. Burke also came to the rescue using his position as Paymaster General to appoint him official painter to the Chelsea Hospital. Barret died in 1784 and is buried in Paddington Green Church. Mathew Pilkington , Narret's contemporary and admirer, gives an acute account of his art.